Dozens of vintage airplanes flew over Washington, DC to commemorate the 70th anniversary of the victory in Europe in World War II. The air show, dubbed “The Arsenal of Democracy,” featured trainers, fighters and bombers used by the Allies. 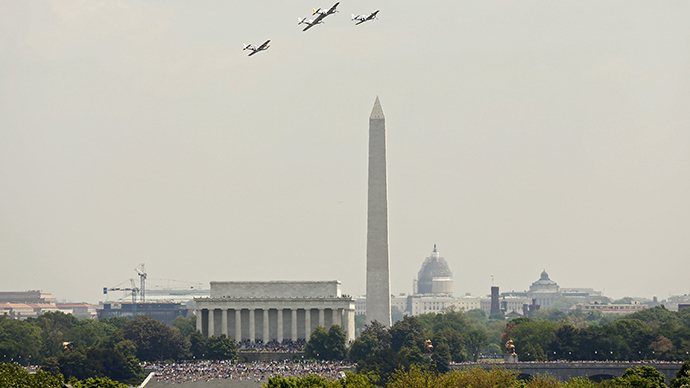 Flying as low as 1000 ft (300 meters) above the National Mall, a total of 56 planes, comprising nineteen different types of aircraft, symbolically reenacted major WWII air campaigns in which the US participated, from Pearl Harbor to the atomic bombing of Japan. 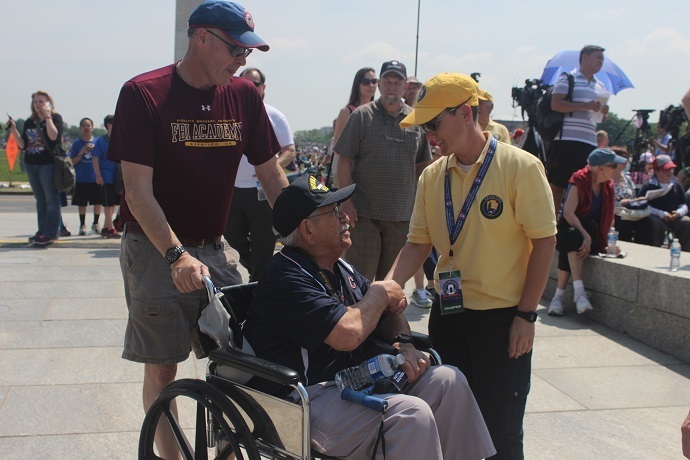 Nearly 300 WWII veterans were expected at the World War II Memorial in the center of the Mall, with thousands of spectators observing the commemorative wreath-laying ceremony that preceded the flyover. 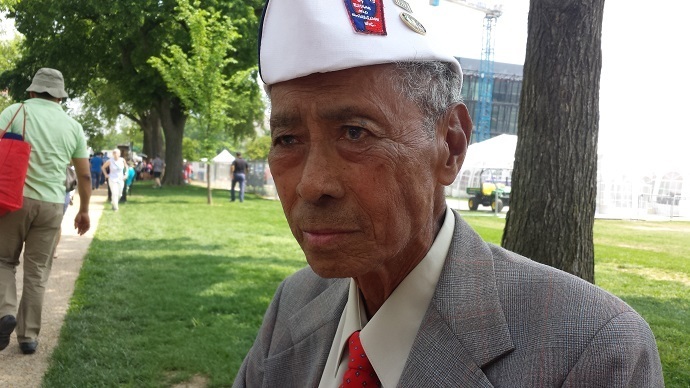 Jesse M. Baltazar, a survivor of the Bataan Death March in the Philippines, told RT that the flyover reminded him of the opening days of World War II in Manila, where he was in school. He thinks the younger generations are lucky that they didn’t have to live through the horrors of World War II. Baltazar would later go on to join the US Air Force, doing intelligence, serving in both the Korean and Vietnam Wars before transitioning to the State Department, where he still works today. He is the oldest employee there, he said. 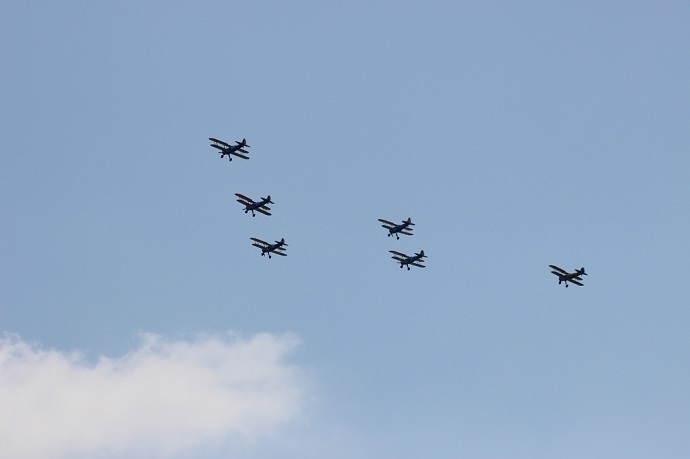 The demonstration began with training formations that included Boeing Stearman, Piper L-Bird, North American T-6/SNJ and Cessna/Beech Twin Bomber trainer aircraft. The training planes were followed by the Pearl Harbor formation, featuring Curtis P-40 Warhawks. 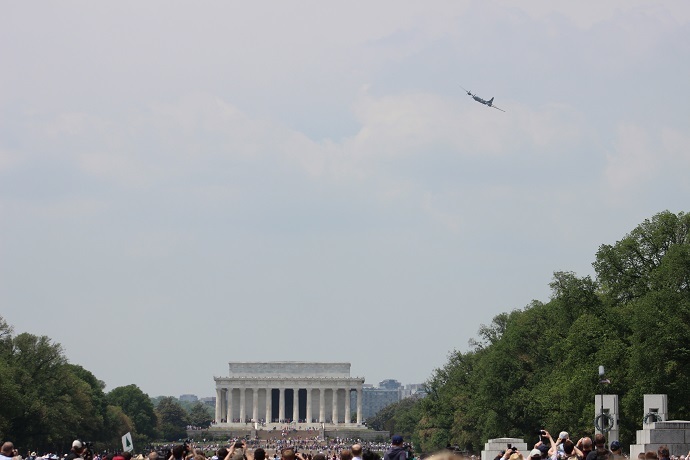 The flyover began at 12:10 p.m. local time and lasted for almost an hour. The demonstration began with training formations that included Boeing Stearman, Piper L-Bird, North American T-6/SNJ and Cessna/Beech Twin Bomber trainer aircraft. The Doolittle Raid came next, with B-25 Mitchells. The Guadalcanal Campaign formation featured Bell P-39 Airacobras and P-63 Kingcobras. This was followed by the Battle of Midway, with formations of Consolidated PBY Catalina, Grumman F4F/FM-2 Wildcat and Douglas SBD Dauntless aircraft. Recreating the shooting down of Japanese Admiral Isoroku Yamamoto, the architect of the Japanese Navy who personally planned the Pearl Harbor attack, Lockheed P-38 Lightnings flew in formation. Yamamoto’s plane was shot down during a raid by 16 P-38s. The ceremony then turned to the European theater, beginning with the Ploesti Raid, featuring Consolidated B-24 Liberators. Next came the fighter escorts, P-51 Mustangs nicknamed “Little Friends” for their role in protecting larger planes during bombing raids. Formations were scheduled at 90-second intervals, although there was a slight delay between the P-51 Mustangs and the B-17 Flying Fortresses. During that time, the emcee regaled the audience with facts and stories about the famed B-17, a four-engine heavy bomber. Of the nearly 13,000 planes produced during World War II, maybe a dozen remain operational today. D-Day was represented by the Douglas C-47/R4D Skytrain and B-26/A-26s. The ceremony then pivoted back to the Pacific theater for the Marianas Turkey Shoot, with formations of Grumman TBM Avengers, an F6F Hellcat, F8F Bearcats and the Curtiss SB2C Helldiver. As the war intensified in both Europe and the Pacific, the formations took turns representing battles in each theater. The Battle of the Bulge saw Republic P-47 Thunderbolts, while Iwo Jima was portrayed by the Vought FG-1D Corsairs. A special participant in the victory formation was “FiFi,” the last B-29 Superfortress still flying. The two planes that dropped atomic bombs on Japan in August 1945, the Enola Gay and Bockscar, were also B-29s. Rep. Sam Graves (R-Missouri) flew the final “missing man” formation. Graves told The Hill he would be piloting the same type of torpedo bomber flown by former President George H.W. Bush during the war. The same model, a Grumman TBF Avenger, was later seen making an emergency landing at Ronald Reagan Washington National Airport, due to a hydraulic problem. There has been no confirmation as to whether it was the plane piloted by Graves. The airport, just across the Potomac River from the flyover location, was closed to commercial air traffic during the event. The Arsenal of Democracy organizers worked closely with the Federal Aviation Administration (FAA), Transportation Security Administration, the National Park Service, the US Capitol Police and the US Secret Service. The planes left from two Virginia airports, with the bombers taking off from Manassas and the fighters taking flight from Culpeper. 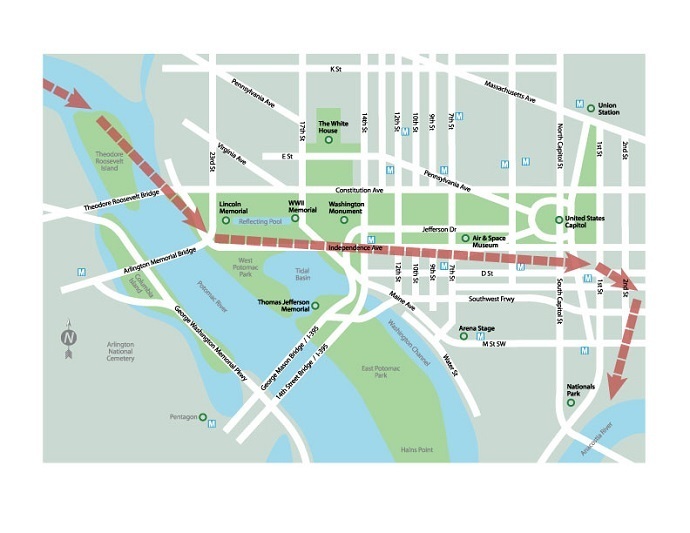 They rendezvoused near Leesburg before heading down the Potomac to the National Mall. The historic aircraft will be on display Saturday at the National Air and Space Museum’s Steven F. Udvar-Hazy Center in Chantilly, Virginia.